The project that I decided to bring on the trip to Chicago was a long time coming – I bought the yarn and pattern book to make this sweater a while ago. 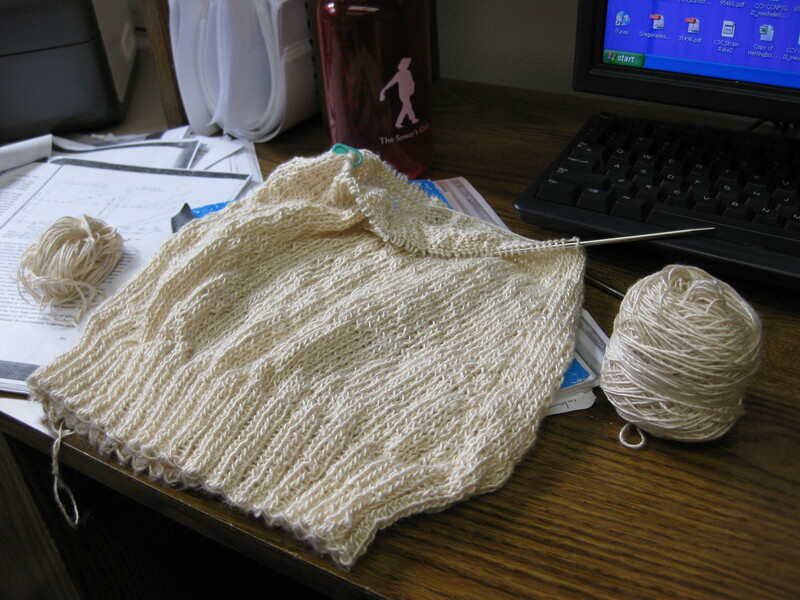 Actually, I just realized I can check Ravelry and see exactly when I queued it: August 28, 2008! Wow! I didn’t realize it had been that long! In any case, Olivia got started on the plane to Chicago, and just got finished up a few evenings ago. This project got put on hold because of my issues with gauge. 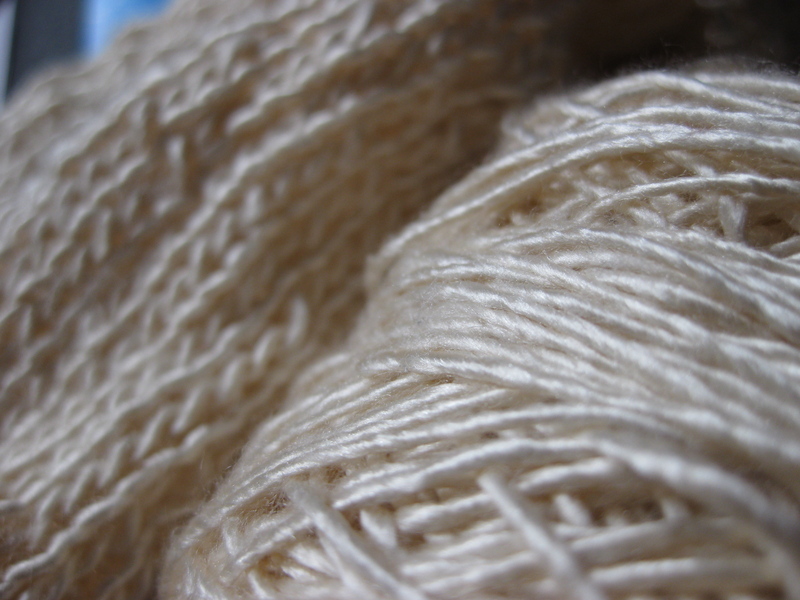 In the past year, I’ve come to learn that I’m a very loose knitter compared to some. Case in point – this pattern calls for a size 5 needle, and I ended up going with a size 2 and working the pattern two sizes smaller than Linden-size! That’s a nice adjustment to make, though, so I won’t complain. The pattern is Olivia from Kim Hargreaves’s Thrown Together. 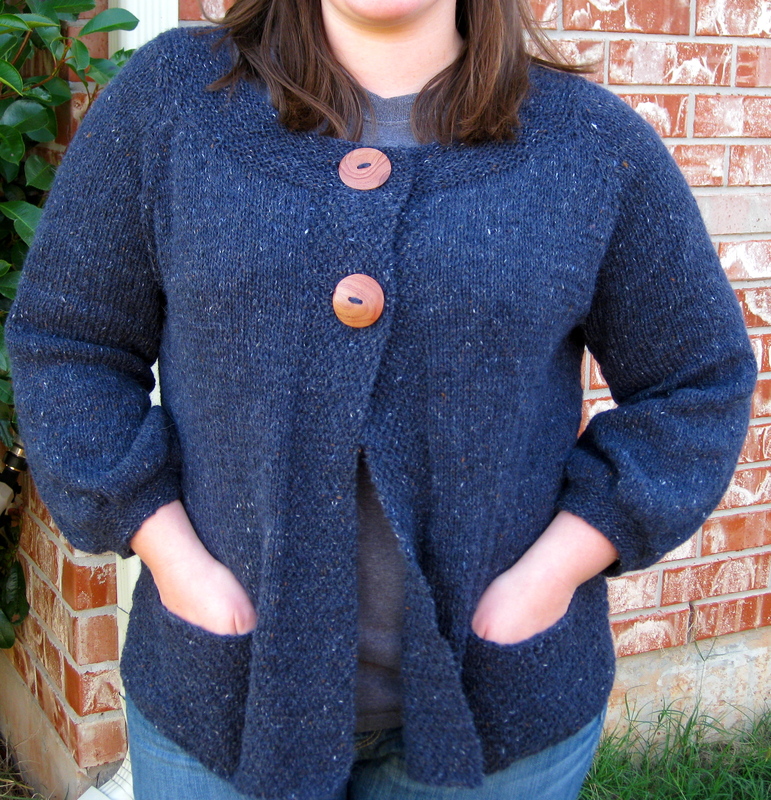 I loved this sweater so much, that I bought the yarn the pattern called for in the same color as the model! 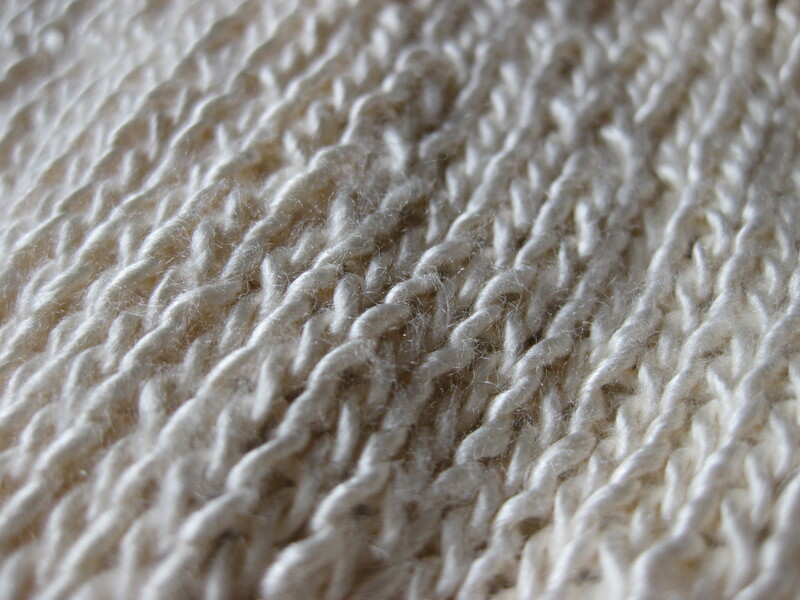 It’s Rowan Felted Tweed in Seafarer, and I can’t express how much I adore this yarn. It’s so soft and tweedy and such a pretty color. Using the called for yarn definitely payed off – this is the first time that I’ve ended up with a sweater that looks almost exactly like the picture and I love it . . . I decided to knit the sweater in one piece to eliminate seaming. 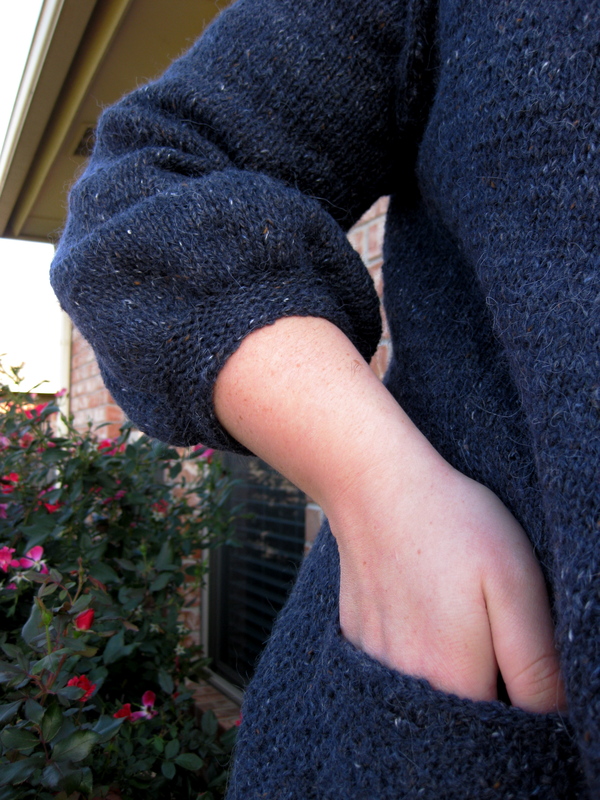 I knit the sleeves in the round, and joined them to the body to work the raglan yoke all at once. The thing that I love about this sweater is all of the details. I love the little pockets hidden in the moss stitch edging, I love the way the sleeves blouse out from a cute little garter stitch cuff, and I am really happy with the raglan decreases. Instead of working a two stitch decrease every other row, Olivia calls for you to decrease four stitches every fourth row. This pattern of decreasing eliminates the line of decreases that I’ve always had with raglans, and I think it adds a really cute detail. I’ll definitely be using this technique again! It’s all about the details with this sweater . . . Thrown Together is a great book by one of my favorite designers, and I’m planning a few more projects from it – specifically, Nan and Polly! Stay tuned to see these come to life (Nan first, Polly later). Oh, and I almost forgot that I made Aimee for Emily’s wedding from this book! I’m starting to think Thrown Together was a really good investment . . .
Also, I’m planning to let you know what’s up with Oblique soon. Well, as soon as a figure out how to fix it . . . let’s just say that this was my first major experience with alpaca stretching during blocking! We’ll see how my planned sweater surgery goes.